File photo from January crime prevention meeting. Anger and jubilation don’t often coexist, but they found occasion to mingle during the first 15 minutes of Tuesday’s Humboldt County Board of Supervisors meeting. All five board members seemed to have a little bounce in their steps as they filed into chambers shortly before 9 a.m., and after the consent calendar was approved, Supervisor Rex Bohn introduced a special presentation with childlike enthusiasm: “We’re gonna have a party on Saturday!” he said. That would be the Neighborhood Watch Block Party in Eureka’s Carson Park, which was largely organized by two Eureka neighborhood watch captains, Jeannie Breslin and Jean Scheffler. They, too, were brimming with happy energy, seated in the front row Tuesday. Bohn read a proclamation declaring this upcoming Saturday “Neighborhood Watch Block Party Day” in Humboldt County before coming down from the dais to hug the two women. A smiling Supervisor Virginia Bass modeled an electric-yellow neighborhood watch safety vest, swiveling her shoulders playfully. That shouldn’t be too hard for many Eurekans. 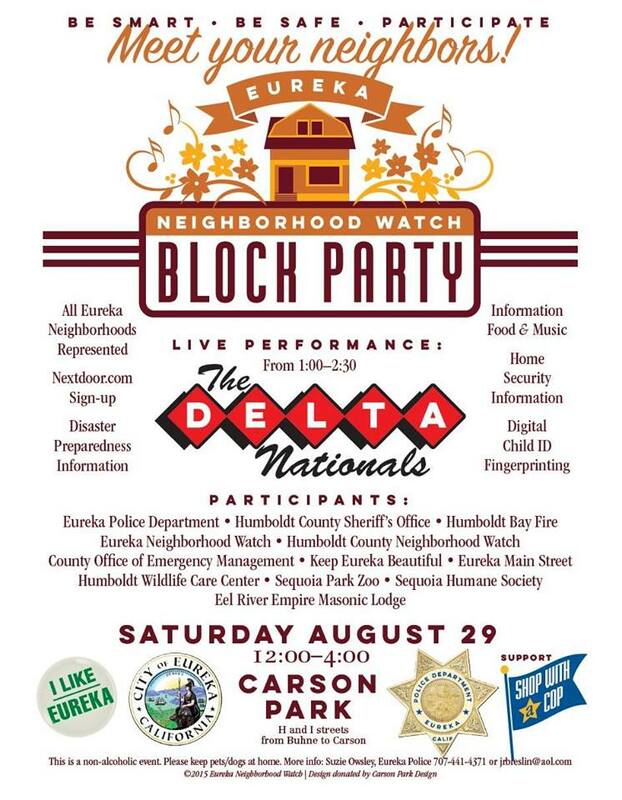 Saturday’s block party aims to galvanize the accumulated frustration of residents who feel increasingly besieged by petty (and not-so-petty) criminals. Saturday’s event defies such attitudes with a literal party, albeit one fueled by frustration and a sense of urgency. Violent crime in Eureka has actually declined over the past two-and-a-half years. But property crime is another story. The graph below shows a slow upward trend in property crimes, which include burglary, theft and car theft. That slow ascent may not look too alarming, but here’s the rub: Among cities with at least 20,000 residents, Eureka has the highest property crime rate in the state. We mentioned this ignominious distinction last September, when the most recent data from the FBI’s “Uniform Crime Reports” was from 2012. The 2013 data has since come in, and we’re still at the top of that list, by a pretty wide margin. Eureka saw 78 property crimes per 1,000 residents in 2013. The statewide average was less than 27 per thousand residents, barely a third the rate seen in Eureka. The city with the second-highest rate was Oakland, which had 62 property crimes per 1,000 residents, more than 20 percent below Eureka’s rate. With a margin that large it’s fairly safe to assume that our Victorian Village remains the property crime capital of California here in 2015. But Eureka’s existential malaise runs deeper than these numbers, or even the crimes behind them. The most common complaints among locals tend to include references to “tweakers,” “meth-heads” and the homeless, people deemed unsightly and unwelcome regardless of their connection to crime (or lack thereof). The nascent effort to rehabilitate Eureka’s self esteem — neatly symbolized by those “I Like Eureka” bumper stickers — seems aimed at growing and harnessing civic pride as an antidote to crime. The more people “like” Eureka, this theory goes, the more people will be motivated to defend and improve it. At the supervisors’ meeting she extolled the virtues of community organizing website Nextdoor.com, calling it a “game changer,” and Scheffler, her co-presenter, said at least 18 neighborhoods will be participating in Saturday’s event. “We’re standing up for Eureka, is what we’re doing,” Scheffler said. Below is Larry Trask’s interview with Breslin and Eureka Police Department’s Suzie Owsley on KHUM. And below is where you’ll find Carson Park. The event will take place rain or shine. Organizers are asking folks to leave their dogs at home. Extra parking will be available at the old Marshal School on the corner of Trinity and I streets.